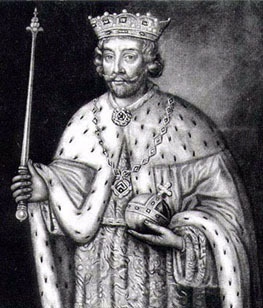 Edward II, King of England, the fourth son of King Edward I by his first wife Eleanor of Castile, was born at Carnarvon Castle on the 25th of April 1284. The story that the king presented the newborn child to the Welsh as their future native prince is quite unfounded, for Edward was only made Prince of Wales in the Lincoln parliament of 1301. When a few months old, he became by his elder brother's death the heir to the throne, and Edward I took great pains to train him in warfare and statecraft. He took part in several Scots campaigns, but all his father's efforts could not prevent his acquiring the habits of extravagance and frivolity which he retained all through his life. The old king attributed his son's defects to the bad influence of his friend, the Gascon knight Piers Gaveston, and drove the favorite into exile. When Edward I died on the 7th of July 1307, the first act of the prince, now Edward II, was to recall Gaveston. His next was to abandon the Scots campaign on which his father had set his heart. The new king was physically almost as fine a man as Edward I. He was, however, destitute of any serious purpose, and was, as William Stubbs says, "the first king after the Conquest who was not a man of business." He cared for nothing but amusing himself, and found his chief delight in athletics and in the practice of mechanical crafts. He was not so much vicious as foolish, and wanting in all serious interests. He had so little confidence in himself that he was always in the hands of some favorite who possessed a stronger will than his own. In the early years of his reign Gaveston held this role, acting as regent when Edward went to France -- where, on the 25th of January 1308, he married Isabella, the daughter of Philip the Fair -- and receiving the earldom of Cornwall with the hand of the king's niece, Margaret of Gloucester. The barons soon grew indignant at Edward's devotion to his "brother Piers", and twice insisted on his banishment. On each occasion Edward soon recalled his friend, whereupon the barons, headed by the king's cousin Thomas, Earl of Lancaster, went to war against king and favorite, and in 1312 treacherously put Gaveston to death. Edward was not strong enough even to avenge his loss. He was forced to stand aside and suffer the realm to be governed by the baronial committee of twenty-one lords ordainers, who, in 1311, had drawn up a series of ordinances, whose effect was to substitute ordainers for the king as the effective government of the country. But in all the ordinances nothing was said about the commons and lower clergy. Parliament meant to the new rulers an assembly of barons just as it had done to the opponents of King Henry III in 1258. The effect of their triumph was to change England from a monarchy to a narrow oligarchy. During the quarrels between Edward and the ordainers, Robert the Bruce was steadily conquering Scotland. His progress was so great that he had occupied all the fortresses save Stirling, which he closely besieged. The danger of losing Stirling shamed Edward and the barons into an attempt to retrieve their lost ground. In June 1314 Edward led a great army into Scotland in the hope of relieving Stirling. On the 24th of June his ill-disciplined and badly led host was completely defeated by Robert Bruce at Bannockburn. Henceforth Bruce was sure of his position as king of Scots, and his pitiless devastation of the northern counties of England was his wild vengeance for the sufferings his land had previously experienced from the English. Edward's disgraceful defeat made him more dependent on his barons than ever. His kinsman, Thomas of Lancaster, had now an opportunity of saving England from the consequences of the king's incompetence. He had shown some capacity as a leader of opposition, but though he had great wealth, and was lord of five earldoms, he had small ability and no constructive power. In his desire to keep the king weak, he was suspected to have made a secret understanding with Robert Bruce. Before long the opposition split up under his incompetent guidance into fiercely contending factions. Under Aymer of Valence, Earl of Pembroke, a middle party arose, which hated Lancaster so much that it supported the king to put an end to Lancaster's rule. After 1318 the effect of its influence was to restore Edward to some portion of his authority. However, the king hated Pembroke almost as much as Lancaster. He now found a competent adviser in Hugh le Despenser, a baron of great experience. What was more important to him, he had in Despenser's son, Hugh le Despenser the younger, a personal friend and favorite, who was able in some measure to replace Gaveston. The fierce hatred which the barons manifested to the Despensers showed that they could hate a deserter as bitterly as they had hated the Gascon adventurer. They were indignant at the favors which Edward lavished upon the favorite and his father, and were especially alarmed when the younger Despenser strove to procure for himself the earldom of Gloucester in right of his wife, Edward's niece. At last, in 1321, the barons met in parliament, and under Lancaster's guidance procured the banishment of the Despensers. The disasters of his friends inspired Edward to unwonted activity. In 1322 he recalled them from exile, and waged war against the barons on their behalf. Triumph crowned his exertions. Lancaster, defeated at Boroughbridge, was executed at Pontefract. For the next five years the Despensers ruled England. Unlike the ordainers, they took pains to get the Commons on their side, and a parliament held at York in 1322 revoked the ordinances because they trenched upon the rights of the crown, and were drawn up by the barons only. From this time no statute was technically valid unless the Commons had agreed to it. This marks the most important step forward in Edward II's reign. But the rule of the Despensers soon fell away from this wise beginning. They thought only of heaping up wealth for themselves, and soon stirred up universal indignation. In particular, they excited the ill-will of the queen, Isabella of France. Craftily dissembling her indignation, Isabella kept silence until 1325, when she went to France in company with her eldest son, Edward of Windsor, who was sent to do homage for Aquitaine to her brother, the new French king. When her business was over, Isabella declined to return to her husband as long as the Despensers remained his favorites. She formed a criminal connection with Roger Mortimer of Wigmore, one of the baronial exiles, and in September 1326 landed in Essex accompanied by Mortimer and her son, declaring that she was come to avenge the murder of Lancaster, and to expel the Despensers. Edward's followers deserted him, and on the 2nd of October he fled from London to the west, where he took refuge in the younger Despenser's estates in Glamorgan. His wife followed him, put to death both the Despensers, and, after a futile effort to escape by sea, Edward was captured on the 16th of November. He was imprisoned at Kenilworth Castle, and a parliament met at Westminster in January 1327, which chose his son to be king as King Edward III. It was thought prudent to compel the captive king to resign the crown, and on the 20th of January Edward was forced to renounce his office before a committee of the estates. The government of Isabella and Mortimer was so weakly established that it dared not leave the deposed king alive. On the 3rd of April he was secretly removed from Kenilworth and entrusted to the custody of two dependants of Mortimer. After various wanderings be was imprisoned at Berkeley Castle in Gloucestershire. Every indignity was inflicted upon him, and he was systematically ill-treated in the hope that he would die of disease. When his strong constitution seemed likely to prevail over the ill-treatment of his enemies he was cruelly put to death on the 21st of September. It was announced that he had died a natural death, and he was buried in St. Peter's Abbey at Gloucester, now the cathedral, where his son afterwards erected a magnificent tomb. On the night of October 11 (1327 AD) while lying in on a bed (the king) was suddenly seized and, while a great mattress... weighed him down and suffocated him, a plumber's iron, heated intensely hot, was introduced through a tube into his secret parts so that it burned the inner portions beyond the intestines. Edward's wife, Isabella (c. 1292-1358), bore him two sons, Edward III and John of Eltham, earl of Cornwall (1316-1336), and two daughters, Isabella and Joanna (1321-1362), wife of David II, king of Scotland. After the execution of her paramour, Roger Mortimer, in 1330, Isabella retired from public life; she died at Hertford on the 23rd of August 1358.